Ok, I totally swiped the recipe from my good friend, Erin. This is my version… it has a little more garlic and a little less taco seasoning. They’re both seriously tasty though! Combine all ingredients in a food processor or blender and blend until smooth. (Add water one tsp at a time if consistency is too thick for your taste). Serve with pita or tortilla chips. Enjoy! -Combine all ingredients in a food processor or blender and blend until smooth. (Add water one tsp at a time if consistency is too thick for your taste). 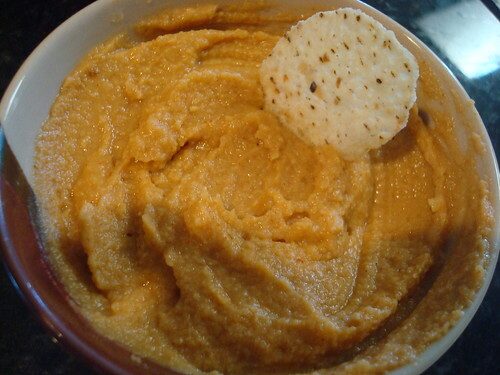 -Serve with pita or tortilla chips. Enjoy! This looks seriously yummy!! Will try it out soon!! Thanks! Oh, wow. I love this. Can't wait to try it out! Your dip recipes rock!